The Water Essence was made from an alchemic blend of two Essences – one from each hemisphere; they were prepared on the isle of Iona, on the west coast of Scotland and Heron Island on Australia’s Great Barrier Reef. This remedy allows you to intensely experience your own emotional disharmony so that it may then be purified and released. The Water Essence illuminates the conscious mind so as to reveal and initiate the release of our deepest, most ancient negative karmic patterns. It also dissolves the boundaries of a person’s perceptions and realities. It is very nurturing and cleansing and encourages us all to be more open to receiving and trusting of ourselves and feel Spirit’s love vibration that surrounds us. This Essence enables us to find the inner stillness in which to experience our feelings fully and achieve emotional harmony. It creates the deep knowing that whatever challenge that one is encountering, you will be all right and helps one from staying emotionally closed off after a negative or traumatic experience. Prepared in the sacred cave at the village of Patal Bhuvaneshwar in the north of India. The Earth Essence helps to heal internal structure and order in life and is a very important grounding remedy, especially for those doing a great deal of Spiritual work. This Essence allows one to tune into the subtle realms and vibrations. It fosters a strong connection, respect and reverence to nature, the Ancients, the earth, the life-force, life and the origins of life. It enables “Light workers” to find their drive and move forward with purpose. This Essence will allow them to be centred, grounded and find their direction and then proceed forward with clarity and focus. The Earth Essence helps establish a connection with the Manu of a country, thereby allowing you access and connection to the Essence or vibrational quality of that country. The Water Essence, by helping to dissolve away the limitations of where you believe you are capable of going prepares the way for the Earth Essence to then take you beyond your old reference points and limitations. This Essence was made in the sacred area of Katajuta in Central Australia. It encompasses the passion, creation, possibilities and potential of Fire. One aspect of the four Elemental White Light Essences — Fire, Water, Air and Earth — is that they help you to connect, embody and master that element while also aligning you to the Nature Spirit of each particular Element. The Essence helps with the burning off of one’s dross — or impurities, especially that of the astral body. This Essence can open people to their most ancient source, back to the moment when the soul originally chose the life purpose for its earthly incarnation. This will leave the individual with a “fiery” sense of purpose and direction. Consequently, one is inspired and motivated to follow their life path and fulfil their highest destiny. This Essence was prepared at the Mayan ruins in Palenque, Mexico. It allows one to align to and access their Higher Self. The Higher Self Essence funnels and channels energy of the highest order into one’s very core, from where it will radiate out and expand dramatically. It helps us to be aware of what is beyond the physical experience and can help one tap into sources of ancient wisdom and knowledge. Our Higher Self is comprised of every lifetime we have ever had and this Essence offers the opportunity to help a person connect with these earlier incarnations. You will then be able to beam back the energy of whatever it is that you need from that past life. This Essence was prepared on the summer solstice in the Chalice Well Garden in Glastonbury, England. The Devic Essence helps to establish very strong links with the Devic kingdom, while its spiritual healing quality returns one to a place of simplicity and blissful peace. It brings about a feeling of total oneness — being at one with absolutely everything and far less concerned and preoccupied with the hassle and problems of life. It enables one to contact and communicate with nature, and to listen to any message the plant kingdom has for us. This remedy attunes you with qualities such as healing, from the Devic kingdom and will help to earth anyone who is ungrounded or out of control, connecting them back to nature. The Devic Essence is very good to soothe and calm those who are stressed out, wound up, stuck for time or feel disconnected. The Devic Essence assists us to care for ourselves on a spiritual level and brings about a devotional, nurturing quality within us for ourselves and others as well as nature. Most importantly, it will help you to remember why you are here, and assist those who remember their destiny to take action and become more passionate about their life path once again. The Devic Essence also allows us to appreciate the great importance of knowing and remembering that we are a soul being that has, but is not, a physical body and can be used for people close to passing over. This Essence was made in Peru on the top of the sacred mountain, Putucusi, directly across from Machu Picchu. Right up until the moment of our death, the Angels are always attempting to inspire and raise our awareness to the spiritual — so that we will look up and embrace the Light. The Angelic Essence allows one to have closer contact with the Angelic realm. This Essence helps us to be more open to receiving from on high, the Angelic tones of inspiration, love, awareness, communication, guidance and instruction which can lead us to an infinite range of potential possibilities in our mortal lives. The Angelic Essence brings the energy from heaven directly down to earth, uniting the two. This Essence enables one to aspire beyond the physical while keeping us connected to the mundane. It helps us realise that the spiritual exists in everything and to transcend the deceptive illusion of the physical. One can also invoke protection of an Angelic kind and of any specific Angel by taking this Essence. I am only on Earth Essence at the moment but I thought I would offer these for sale because I am sure that these work. 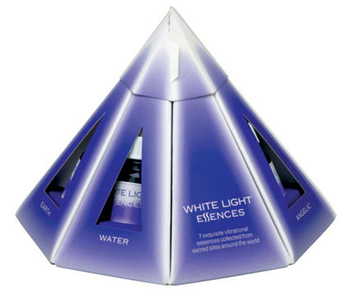 However I want to be completely honest and warn people that I took the Light Essences last year and I think that is why I am having such a wonderful and easy time with these White Light Essences. I have reports from some friends who took the Water Essence years ago and it brought up a lot of emotions and they stopped taking them. They did go back to them but it has to be something that you feel really ready for. I don’t want to discourage people but I do want them to really trust their intuition and be very aware that each individual persons reaction to these high vibrational essences is very different. A dose bottle is made by mixing top quality spring water, quality brandy and drops from the Original Essence stock bottles. The brandy is needed as an old fashioned preservative and the taste is very watered down. Postage is $10 within Australia and $30 for International. or email earth.star.rising@gmail.com if you have any questions.